Waking up to yet another snow storm here in Toronto, I can't help but wonder... Winter, snow, slush, ice-skating your way to work would have been more relevant issues for me :-) Oh well, they say it'll all be over after March. Meanwhile I can only dream of last spring, our first one in Toronto and it was spectacular. This photo was taken in Toronto's Botanical Gardens. This couple is admiring spring's blossom. (Mar 18th-Mar 24th): "Accessories and Jewelry"
(Mar 25th-Mar 31st): "Coffee and Tea"
(Apr 1st-Apr 7th): "Trash Cans"
By submitting information to Global Themes, you grant Global Themes a perpetual, royalty-free license to use, reproduce, modify, publish, distribute, and otherwise exercise all copyright and publicity rights with respect to that information at its sole discretion, including storing it on Global Themes servers and incorporating it in other works in any media now known or later developed including without limitation published books. If you do not wish to grant Global Themes these rights, it is suggested that you do not submit information to this website. Global Themes reserves the right to select, edit and arrange submissions, and to remove information from the Global Themes website at any time at its sole discretion. 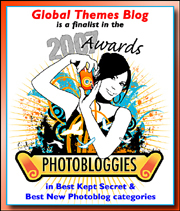 All posts (c)copyright 2006-2013 of Global Themes unless stated otherwise.. Powered by Blogger.